To see the Historic Landmarks that received awards this year click here. The village of Oak Park received praise in the form of numerous awards at last month's Historic Preservations Awards held at Unity Temple. Considered one of the most beautiful spaces in America, Unity Temple was packed full of 100-plus attendees at this year’s awards event that paid tribute to local owners, contractors and architects. Chris Morris, chair of the Oak Park Historic Preservation Commission, gave opening remarks, acknowledgements and introductions, while Doug Kaarre, urban planner and staff liaison, presented the 11 residences that were honored as historic landmarks. Led by Kaarre, the commission has been prolific in researching, documenting and land-marking such sites. Landmarks Illinois President Jim Peters praised Oak Park as having one of the most respected and proactive commissions in the state. Peters said he was impressed with the 11 landmark nominations this year. The Prescott home at 244 Forest, renovated by architect Rosanne McGrath, is a delightful example of a 19th century home returned to its original Italianate design. The house was remodeled extensively in 1941 with awkward Colonial Revival elements. A few historic photographs were found which allowed the owners Jim and Sally Prescott, contractor David Himelick and McGrath to visualize and reconstruct the original façade. The entry elevation was completely transformed with new 4-inch clapboard siding, well proportioned double hung windows, a bracketed cornice, a bluestone porch with supporting turned porch posts, and a crisp white and navy blue color scheme. Completing the charming renovation, a new wood double entry door and an octagon bay window were installed. "This is the first phase of a number of projects planned for the property and this type of renovation can take years to complete," said McGrath. The owners are very proud of the home that now is equal in dignity with the other much larger homes on such a prestigious block. Now, the tourists are photographing their beautiful home along with Wright’s residences in the neighborhood. The Santa Maria Condominiums at 208-232 N. Oak Park and 719-723 Erie, designed by architect Roy France in 1924, is a spectacular example of the courtyard type residential building. It is rare to see an apartment building of this quality and detail. In 2007 the Santa Maria Condo Association began a large and costly terra cotta restoration project. The largest component of the project was restoring eight highly ornamental portico entrances. Over the decades, many of the original terra cotta pieces had been broken, cracked or lost. During their assessment of the porticos, engineers also discovered that the original structure had corroded and was no longer stable. This required the porticos to be dismantled so that the underlying steel frame could be reinforced or replaced with new steel. Every effort was made to remove and to preserve as many original terra cotta pieces as possible, which were stored and reused in the reconstruction. But hundreds of pieces of newly molded terra cotta were created to match the original missing or damaged portico elements and window surrounds. Credit must be given to the condominium association for the quality and integrity of the restoration that was designed by architects Klein and Hoffman, along with LS Contracting Group. 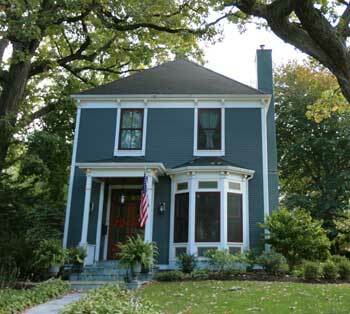 Beginning in 2009, the Pleasant Home Foundation and the Park District of Oak Park undertook the restoration of all existing masonry of Pleasant Home. This comprehensive masonry and roof repair project included re-pointing all exterior limestone, resetting stone foundations, refastening the chimney stone, sealing the brick masonry joints, resetting the limestone planting bed, and restoring the northeast corner of the front porch wall. Because the scope of the project was so large, the foundation and park district drew upon a large group of donors, including Tourism Cares Worldwide, Landmarks Illinois, Partners in Preservation, the Richard H. Driehaus Foundation, and others to secure the necessary funding. "Our National Historic Landmark house once again can be seen as architect George Maher envisioned it with its limestone masonry plinth and porch wall rebuilt and tuck pointed and the imposing chimneys safe, sound and weather tight," said local architect Frank Heitzman, who served as one of the many judges that decided the award winners. "This project was a model of collaboration between Mark 1 Restoration who did a superlative historic repair job, and members of the building restoration committee Steve Kelley and Amy van Aalst who climbed on the soaring scaffolding to observe the repair work close up, and local structural engineer Ken Floody who found a solution for an unusual and unexpected foundation problem." As part of the criteria for the submittals, the structures could be located anywhere within the village and need not be in an historic district. The work must have been completed within the last five years, and the nominations could come from owners, architects or contractors. The commission nominates projects to encourage more participation as there are many more wonderful projects that should be recognized. Much of the work of preservation is invisible and selfless, often never acknowledged by the public. The Oak Park Historic Preservation Commission is determined to expose this work to our village with the goal of expanding, increasing the quality and bringing more appreciation to the altruistic work. The work of saving the past is a vital activity in our community that builds optimism towards a sustainable future. These buildings are a record of history containing the rich and layered memories of the owners and the general public. The encouragement to preserve historic buildings and the education of the public regarding its process is the core objective of the commission.